Why pay for Slate + is the app doesn’t even work? App starts to open and shuts down immediately. And I have slate plus! Please fix. Search function works but there’s no way to back out of the article. Can’t get to home page or do another search. Just realized I should clarify...I’m referring to the UI for Slate podcasts and Slate+. I really enjoy the content produced by Slate. So much so, I am a Slate Plus member. However, after listening to another podcast once again extolling the virtues of Slate Plus Membership, particularly the “no ad” feature, I have to call Slate out. You just fed me an ad. Please, get it right before renewal comes up. Hint: I won’t renew as is. Also, the podcasts feeds are confusing when searching via, podcast, then selecting the show, and the episodes are listed. There are often multiple shows listed, with no clarification given. Also, just heard another ad-for a live show on Trumpcast! Sick of the auto play video ads. Deleting the app. Worst APP ever. And, $35 to boot! If you’re hoping to listen to Slow Burn extras, forget it. The search function is broken. Viewing a list of podcasts returns a blank screen. Selecting the Slate Plus section returns articles from 2016 at the top of the list with no way to sort. I would like to be able to listen to Slate Plus podcasts, but even after joining the service, subscribing on iTunes and stitcher is darn near impossible and the Slate app is useless. Excellent news coverage and analysis! I haven’t had any of the technical problems that others have mentioned. On iPad this is a bunch of photos with captions. Scrolling through all of this and trying to read captions to find stories is annoying and time consuming. Poor design similar to CNN iPad app but even worse to navigate. In the past day or two I find that the app crashes whenever I try to run it. I swear it was working great prior to that. 8/14/2018 I have an IPhone 7 using the latest version of IOS. I click the icon on the screen, it starts to load, the content screen shows up and then about about 1 second latter the apps just quits. I’ve tried restarting my phone, but it still isn’t working. Big fan of slate so I gave it two stars. Am I doing something wrong?!! update: 5 days latter and it still isn’t working. Sadly just canceled my slate plus membership. If I can’t use the app, how can I keep paying for it? 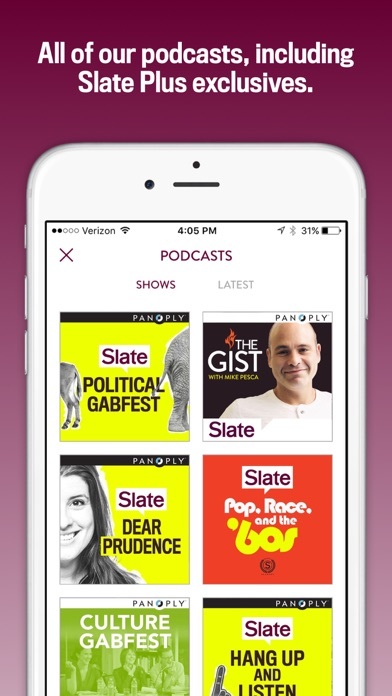 The app doesn’t give me Slate Plus content on some of the podcasts on my iPhone. This app has more graphics than usability. It’s very hard to search for what you want. I guess they want you to scroll through all their fancy graphics, rather than find and listen to the programs you like. This used to be a great app. I’ve been using it for a long time and only recently has it become buggy to the point of absolute annoyance every time I use it. The latest is that it refuses to play videos. All is fine to get to the video, then the last step of clicking the play arrow does absolutely nothing. Doesn’t matter how many times I click. Nothing! The last update created freezing and I have to minimize it and then bring it back up in order to get to a next page which it jumps to in a swipe motion whether I want it to or not. It stops scrolling out of the blue but then will sometimes swipe from right to left. It’s like it can’t make up its mind whether to he a scrolling app or a swiping app. Make up your mind already. I love SLATE and, until now, the app has always been solid. Why can you people never stop fixing things that aren’t broken? Are you afraid you won’t have a job if there’s nothing to upgrade? Using an iPhone 7+. If you read the comments you’ll see that those who insult and denigrate commentators who stray from the party line are tolerated while those who deign to stray from the obvious leanings of the site are cast away. They stir the pot but won’t accept the blowback. It’s all opinion and no news if that’s what you seek. Bon appetit. Do you want to not listen to podcasts which you have already paid access for? Download the Slate app and enjoy being ripped off by an app that won't load audio. I used to access SLATE often every day. Now. My iPhone8 cannot even open it. Whassup?! 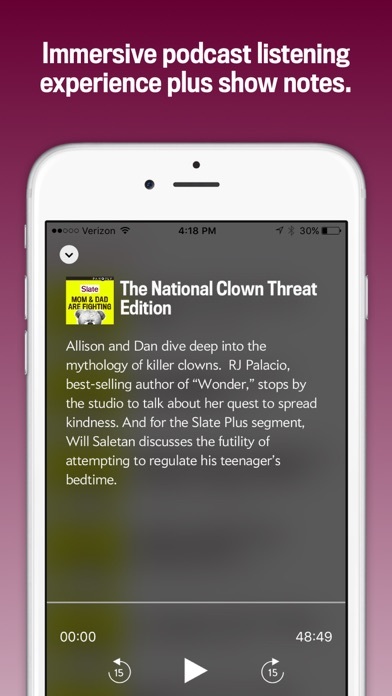 I really like the podcast page, which gives access to all episodes! None of the in article videos play anymore. I have to use the web version on my phone & search for article then play from there. So it's not YouTube's fault. Comments don’t work in the app, crashes all the time. Poorly designed. I want to love this app but I find it to be slow, difficult to navigate, and crashes frequently. And I’m on a up-to-date iOS iPhone 8. The pictures move independently of the headlines as you scroll. It might look fancy, but it’s nauseating for people with motion sickness. Please at least give us the option of turning it off. The articles on Slate are insightful and well written. The variety of topics is impressive. There is always something that deepens my understanding of a subject or makes me look at it in a different way. Horrible app. Works about as well as a can in a string. They recommend the app if you want to listen to the podcasts on an iPhone. I have Slate Plus membership for all the good that does me and I have to constantly log back in to the app. Avoid at all costs. When this app is working, it’s great. However, mine (iPad and iPhone) often just stop serving content—sometimes either articles or podcasts, but sometimes both at once. They just don’t update for some mysterious reason and instead display a blank screen. I’m a Slate Plus subscriber and I find it a bit irritating that I’m paying for this. The app used to be great. A few months ago I noticed it would crash if I tried to navigate to podcasts immediately after i opened the app. I found it would usually work if I restarted my phone (ugh!). But now it crashes before it even finishes launching. And restarting the phone doesn’t help. As a Slate Plus member, I expect better since I’m paying for premium access. I enjoy all of the writers/hosts that present their forms of journalism! The only issues are with the occasional ads which appear in my Slate+ podcasts. Also, being slick and flogging the intercontinental hotel chain through the mention of a lifestyle podcast, as if it’s not an infomercial, is insulting. Don’t do it! Just Audio Journalism not BS please. That’s what I pay for! Crash, crash, crash, crash, crash. I am a Slate Plus member and I am disappointed. The app will not stay open for more than a couple of seconds. Awful. I deleted the app since it doesn’t work. Why have an app that only gives you a menu and page after page of blank white screens no matter the choice of subject selection? Just shows a blank page. They issued an update to fix "gray gradient over articles." That update had no effect. The latest version opens to a blank white screen. I tried deleting the app and reinstalling. Same problem. Please fix. The app on iPad has stopped loading content. Nothing is there. Why is it not working, even after deleting and reinstalling. Whatever the upgrade is, it broke the iPad version of this app! Nothing but blank screens where articles used to appear. Never loads properly - love Slate but hate this app - won't use it again until it's updated. Still not loading at all. Ads pop up constantly, and not even in the app. They open in a separate Safari window, taking you out of the app entirely, and when I attempt to return, guess what? More ads! Trying to read just the headlines of recent articles today I had four ads remove me from the app to view them in my browser plus a funny or die video that popped up three times in a row requiring me to close three windows before I could attempt to read the article I was there for. I love Slate's content, but this app makes it next to impossible to access. EDIT: With the most recent update the app will open but none of the content will load. The April 3 update broke Slate on my iPad. Nothing comes up -blank page - and it crashes. As a paying Slate Plus member, I hope this is fixed pronto, as I miss my daily Slate fix. No featured stories on my new iPad. Just a bunch of boxes undifferentiated as to importance, type content and so on. Doesn't accept comments. They've never figured out the app and still haven't. Good content, terrible technology. April 2018, still the most uninviting news/magazine app. Anybody home? The latest update DOES indeed fix the bug that had been making the app unusable for weeks. (For me anyway.) Congrats! Yay! Glad to see they fixed the missing content problem. 5.3.6 killed the comments on iPhones again. How hard is this to get right and why would I ever be a plus member with this kind of App? 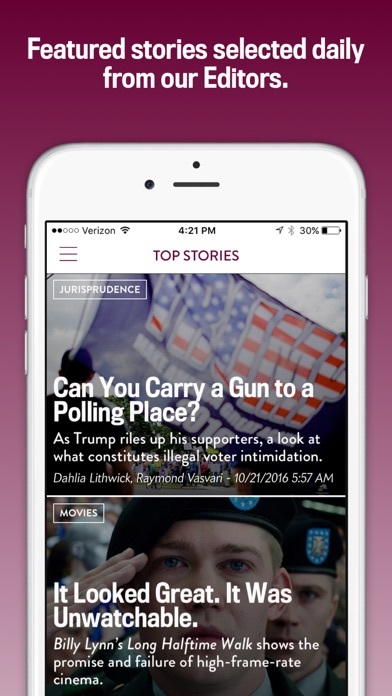 Slate is one of my go-to sources for news, and this app makes it easy. The one weakness with it is around accessing others' comments- it's possible but tricky sometimes. Still, definitely worth downloading! Blank pages only, oh well, back to the browser then. I can't possibly entertain a Slate+ subscription if I can't view content in the regular app. The app update made it a blank page. I'd settle for plain text and no pictures at this rate. I hope you guys fix the app soon. Do you want us to NOT download the app? IPhone 6s, iOS 10.3.3, stopped working on April 4...which is why I am here. The app is now completely blank and void of content. I was a loyal consumer of content through your app. Please fix it. Deleted and downloaded again, didn't work. Content is great, but I have to reinstall it about once a week to get it to work. But then I updated to the latest release. Now when I use the app content doesn't show up unless I use the search feature. I used to enjoy reading Slate even if the app was lame, but the last three updates have left me with blank pages. It opens up, but every page now is blank making it worthless. Three strikes and you are out. Forget them. What a piece of crap. Every page is completely blank! Slate within the iphone news app works fine. Latest update leaves me with a completely blank page. Hey developers, have you heard of TESTING? This latest iteration is so buggy. The Slatest will NOT update, leaving me with 3-week old articles (hardly -est). And the rest of the articles, when opened, get stuck 1/2 inch off to the right or lest (as if the got stuck while swiping) so they can't be read. Grrrr! I have to read them on the webpage, which completely negates the purpose of the app. After the update, no content loads. Attack the service dog. I am deleting the site. If you are a slate plus member, there really should be a list of podcast feeds that is easy to find. Instead, one has to search deep in the bowels of an FAQ to find the slat plus RSS feed list. Also, If I do a search for an article, I have to exit the app to return to the home page since it will otherwise remain stuck on the list of search results. I am about at the end of my two week free trial and am really torn about whether to start paying. The content is great, but the UI is clunky, hit-and-miss. Sometimes I get so frustrated with it I just give up. Worth the $$$? I love Slate and Slate plus but I have a heckuva time trying to find what I want In this app. Even though I type in the exact name of the show In the search bar (which is a bit hard to find to begin with), it often doesn’t show up. And then I have to close the app completely to clear the inaccurate search results and get out of the search mode. Maybe I’m a klutz or a dummy, but I just don’t feel like this app is very intuitive or responsive to the needs of normal user. The days of unbiased journalism are long dead but Slate takes bias to a new level. Good site, decent app, but several glaring weaknesses! Updating an earlier review. I’ve downgraded my rating for one simple, major reason: even at the largest setting, the font size is too small! We should not have to hold our iPhones up to our eyeballs to comfortably read the stories! I have many news apps and they all permit much larger font sizes. Please fix this! You have great material, excellent columnists and news analysts, but this is a HUGE barrier! Another problem concerns commenting. On the iPad, comments do NOT seem available. On the iPhone, they are there, but whenever I try entering one, I get an error message. A third immediate problem is that the spacing of text is often wrong on the iPhone, e.g., in recent lists of movie titles, they all run together! Alas, the other problems with the app remain, so I have left my prior reviews here. The major ones are these: * The different sections -- recent, top, and popular -- still overlap far too much. * There is still no customization of the drop down section list. * The old tabbed sections interface worked better and still needs to be brought back. —————————- PRIOR REVIEWS Slate provides a wonderful collection of articles and columns -- a kind of light Atlantic or New Yorker. The info, topics, and writers are good. The new version is a step up, with a more polished design, ease of use, etc. Now, a 4-star app. However, there are some serious issues. 1. First, the upgrade deletes ALL saved stories! Sheesh! That's App Design 101 and the Hippocratic Oath: "First, do no harm!" 2. Second, there is a major design flaw with navigation in the new version. 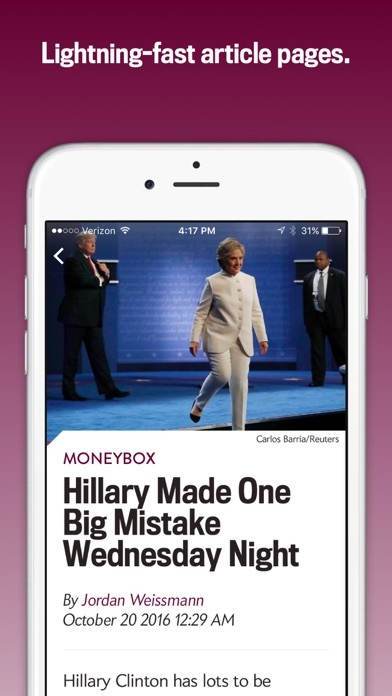 The back arrow for returning to the headline list no longer appears with a simple scroll up or tap! Instead, one is presented with a large top maroon-colored banner--*without* a back arrow! One has to tap a 2nd time-- a nuisance. 3. A third point. The new section system appears to be an improvement in categorization, but is a major step backward in several ways. It's now a left-hand drop down menu, but the previous tabbed interface worked faster, looked cleaner, and made sections more readily accessible. 4. The biggest thing the app needs is a way to customize those sections! For example, we should be able to park our favorite columns or writers there. We always like reading Phil Plait's Bad Astronomy, but it's hard to find. 4a. It would be great if you give us an option to have a tab bar slider across the top-- as well as the drop down--the slider is much more convenient. 5. One major thing is still NOT fixed -- and is even worse now: the stories in the 3 main sections Recent, Top Stories, and Popular overlap greatly! So much so, they are almost indistinguishable! Two of those is all that's needed and with a more select culling of either Top Stories or Popular ones. 6. The background Big Ss behind each of the headlines can often make them hard to decipher! It also looks aesthetically poor. They also jump around a bit when scrolling, so they are distracting to boot. There are also unnecessary! 7. Several of the concerns from the prior review still apply, so I keep that here. -------------------------- PREVIOUS REVIEW The key problems pertain to small font sizing and the jumbled presentation of material! It doesn't matter how good the content is if you can't find it or if parts of the stories or essays are too hard to read! The block quotes in articles and columns, for example, are in too small a font size, even with the font size set at Extra Large. They should be the same size as the regular text. The comments are ridiculously small in size and largely unreadable. The app misses the boat on basic interface guidelines-- the ellipsis ... that should signify further choices -- but is used as a checkmark (for font size). There's no customization of sections-- in fact, there are no sections shown save for Recent, Featured, and Popular! So, the stories and columns are a jumble! The buried list of sections should be put into a sliding tab bar across the top, with user customization of order and topics (see the old Washington Post app for how both should be done). Slate+ is an enhanced version of the offerings, but the FAQ doesn't explain what it is! In the pro column, the astronomy column by Phil Plait is on here. However, it shows up randomly --there's no way of parking it or others in a Favorites section. So, you have to hunt for it and still may not find it. [It's now in the pull down list of sections, but way down, which is inconvenient. Another reason users should be able to customize the section list!] There is a Search box, but then you have to type in his name each time! Look forward to an improved next version! I love Slate and wanted to support them so I joined Slate plus. I downloaded this app for easy access to slate plus content. I've spent more time than I care to mention trying to figure out how to do that. I'm going to have to look at a tutorial or contact email support. Way too much effort to get the content I'm paying for. It’s almost impossible to scroll through the app without getting caught on an ad, which interrupts browsing and dumps cookies on your phone. Poor design, from a reader’s point of view, and not so ideal for the advertisers, either, because it’s a deterrent to opening the app in the first place. Good content but guaranteed frustration. Overall an interesting site but it’s obsessive harping on Israel while ignoring far worse behavior by other countries is disconcerting. The comments section is particularly susceptible to anti-Semitic drivel. Good access to articles and easy to read, but why so slow to change pages from one article to another by swiping? There’s really no excuse on a 2018 iPad. Good site, but the app still has several glaring weaknesses! Updating an earlier review. Slate provides a wonderful collection of articles and columns -- a progressive, light Atlantic or New Yorker. The info, topics, and writers are good. The app, however, needs major work. It also behaves quite differently on the iPad vs. the iPod Touch and iPhone. One weird thing that I just discovered is that I have *TWO* versions of the Slate app on my iPad. What gives with that?? One shows up as 5.3.13 inside the iPad's Settings pane; the other has no info save that its Help section has FAQs applying to versions 5 and up! The 5.3.13 one, which seems to be the latest, has fixed several problems ON THE IPAD, although it has introduced others: There are NO options or settings in the pull-down menu; oddly, its general font size controls are INSIDE of EACH story; and, unfortunately, it displays headlines in a large 3 x 3 block grid of photos + BOLDED words (w/o any article text) rather than the far more inviting scrolling list of smaller photos with headlines and first sentence or brief blurb on each article or column. PLEASE GIVE USERS THE OPTION TO DISPLAY A SCROLLING LIST OF HEADLINES, JUST THE WAY IT WORKS ON THE IPHONES. On the iPod Touch 6 and iPhone SE, version 5.3.13 is an absolute mess. I’ve upgraded my rating to 2 stars because version 5.3.13 ON THE IPAD has fixed the font size issue for stories, although the text for comments still remains far too small and the section interface remains poor, with the same problems that occur on the smaller i-devices! Here are the details. FONT PROBLEM ON IPHONES AND IPOD TOUCHES Even at the largest setting, the font size for stories is far too small to read comfortably. Users should NOT have to hold their devices right up to their eyeballs to read the stories! I have many other news apps and they all permit *much larger* font sizes. Please fix this! It should be adjustable to LARGE sizes on the iPhone and iPod Touch as it is on the iPad as users need or prefer. You have great material at Slate, and excellent columnists and news analysts, but the small font size is a HUGE barrier to reading such great content! It’s way past time that you provide users with bigger font size options. There are other font glitches, too. The spacing of text is often wrong on the iPhone, e.g., in lists of movie titles, they all run together! SECTIONS PROBLEM You still haven’t restored the slider-tab interface or provided users with the ability to customize sections. * The old tabbed section slider interface worked better. A year or two ago, you switched to a left-hand drop down menu, but it’s clumsy. The previous tabbed interface worked faster, looked cleaner, and made sections more accessible. So, please give users an option to restore that. The slider is much more convenient. * There is still NO customization of the drop down section list. It’s a long list, so it means scrolling to get to the section that one wants to read. We should be able to reorder the list and park our favorite columns or writers there. We always liked reading Phil Plait's Bad Astronomy, but he was hard to find — and now, alas, lost for good as he went elsewhere. * The stories in the 2 main sections, Recent and Popular, still overlap far too much! So much so, they are almost indistinguishable! Better culling is needed. COMMENTS PROBLEM Another big problem is that the text in comments is too tiny to read easily! That's true on the iPad as well as the iPhones and iPod Touches. Plus, you provide no way of making it bigger! NAVIGATION PROBLEM Navigation remains obscure on the smaller i-devices. The back arrow for returning to the headline list is hidden. There is a ghostly, barely visible banner at the top, and the back arrow is typically obscured. It should appear as it does on the iPad, a distinct, visible, white left arrow. AESTHETICS AND DISTRACTIONS The background photos and Big Ss behind each of the headlines on the iPhone and IPT interferes with the text and often make them hard to read! It also looks poor aesthetically. The Ss jump around when scrolling, so they are distracting to boot. They are completely unnecessary! Slate+ is an enhanced version of the offerings, but the FAQ doesn't explain what it is! Its stories often aren’t flagged clearly, either. A final note pertains to something that happened with the last major upgrade. It deleted ALL of our saved stories! Sheesh! That's App Design 101 and the Hippocratic Oath: "First, do no harm!" It makes one leery of updating the app! In any case, please give us an option for a scrolling headline display on the iPad and fix the font size and section issues — as well as the other problems. Make sure that the app lives up to the quality of the site itself! Haven't deleted yet, but I don't like ads automatically playing (Sound & Video 😰!) UGH YUCK PTUI! I am not sure what is going on with slate but I can’t read any comments on the app! This latest iteration is so buggy. The Slatest will NOT update, leaving me with 3-week old articles (hardly -est). And the rest of the articles, when opened, get stuck 1/2 inch off to the right or lest (as if the got stuck while swiping) so they can't be read. Grrrr! I have to read them on the webpage, which completely negates the purpose of the app. For me, Slate supplements my primary national and international news sources, the NYT and MSNBC (used to be CNN but CNN mostly is terrible now). Slate provides in-depth analysis and brings in a lot of different sources. Slate writers are also funny sometimes, which I enjoy. I read Slate every day. I've been reading Slate every day for a lot of years, probably since you started. Send me a coffee cup or t-shirt or something. I mostly read on my iPhone and the layout is perfect for reading on my phone. The lost star is because I don't like the layout when I look at Slate on my computer - it's confusing. You do a super job covering the Supreme Court. The site is difficult to wade through; graphics are distracting and cumbersome; no commercials means only podcast and event ads and lots of them; I don’t like the mess of meaningless categories presented and won’t renew; will go back to fast forward over the ads. Should be intuitive instead reminds me of past annoyances like the old MS paperclip. The article in Sully did it for me. Deleting Slate from my news feed. I get that some media sites and reporters don’t like Republicans. I’m not a huge fan of the party myself these days. But to denigrate President George H. W. Bush’s Service Dog “Sully” on 12/3/18 was a step too far. I want deep & complete reporting on facts and encouragement to make up my own mind on the issues of the day. This mean, spiteful article has caused me to reevaluate the “news” I get from Slate, a site that I used to appreciate for its even-handed approach. Now I’m re-thinking my support. This was an unforced error that demonstrates a lack of leadership in Slate’s editorial team. I’m deleting the app & removing Slate from my news feed. I’m a pretty smart person, and appreciate all sides of the stories of the day. Whatever decent & reasonable reporting that Slate wanted to get across to me, or it’s other readers will heretofore not make it into this Independent’s eager consciousness. Time to clean it up, Slate. You used to be more fair & decent. Commenting still not working. I tried submitting a comment and I received an error message. This was after enduring a so-called Christmas Music Trivia podcast that turned out to be a discussion of Britney Spears. That was my last attempt to listen to that podcast. Also, I’m an avid user of the Slate podcasts and wish the app would let me set a preference to opening into podcasts instead of written pieces. Slate Plus is Frustrating to the point of useless. I was very impressed with Slow Burn and for several reasons wanted to purchase Slate Plus to get the in-depth content and also support Slate. I went onto their web site and found it actually pretty confusing to sign up, having to perform many more clicks than needed and there being no obvious way to log in with google or Facebook (you can and it’s pretty obvious in the app) Once I finally got an account, I tried to sign into the Slate Plus version. No dice. URL broken. Then I read it’s easy to do from the Slate app. It’s not. I honestly have no idea how to get that done. Clicking on the Slow Burn podcast brings up an article with links to the non-plus version and nothing to the plus version. Maybe I’m missing something. But I’ve spent way too much time trying to figure something out that should be obvious. I’d hate to be in slate’s shoes. Their app is almost certainly costing them thousands of dollars in lost revenue. Love Slate - it’s one of my go-to sources. But I cannot believe you “splashed” a spoiler for “The Last Jedi” the day it opens! Stating in a big headline that Rey’s parentage will be revealed is a spoiler by itself, and putting it in the headline is worse. At least give us a fighting chance to avoid details. Please do your readers a favor and TAKE IT DOWN! I love Slate's reporting and writing- their articles are concise but informative and include links for those who want to read further. They are also witty and humorous, which given recent topics have been a godsend. Thank u Slate! Not sure if it’s a problem with the app or membership, but I had to log repeatedly to get access to podcasts as a Slate+ member, and it often didn’t work. I haven’t even been able to get in for the last few months, so I’m going to let my membership expire since I have to listen to ads anyhow. I appreciate a diverse news source that allows expression of a wide variety of opinions. So many great podcasts that I joined Slate plus and now hardly listen to any podcast app... keep up the great work! The app is mostly reliable, but not awe inspiring. The one big app complaint I have is I wish the podcast player offered different speeds. Love the variety and thoughtfulness of writers and articles. Can’t get enough! Latest update absolutely kills my battery life. I lost 50% in an hour. Only happens when using Slate app. Didn’t notice any functional differences with this update - app still does/doesn’t work as it has before. You still won’t see all the articles under the “recent” menu option. I look forward to listening to Mike everyday! No android support. Postings can be inaccurate. I pay for slate plus but to frustrating to bother to renew. Sad! Lots of improvement in stability over the last year. Still a bit more buggy than I’d like. So I enjoy reading/listening to Dear Prudence because it gives me a window of insight into what millennial thinking is —but there are a few things about Slate and Dear Prudence that truly annoy me. First, if you are going to have a Facebook page post the link to the freaking column as soon as it comes out. Second, don’t opine on things that you truly have no clue about. Please don’t write advice on child rearing because the advice listed has been stunningly bad. Please don’t give legal advice either, you are generally dead wrong with that too. Stay in your lane and give advice on what you are knowledgeable about. That is good entertainment. As a Newspaper slate offers good mix of current events, especially on the national political front (less so on the international), arts and media coverage, and miscellaneous advice and life hacks. But I really appreciate the app, not only for reading Slate articles, but also for being able to access their wonderful podcasts without having to go through iTunes. 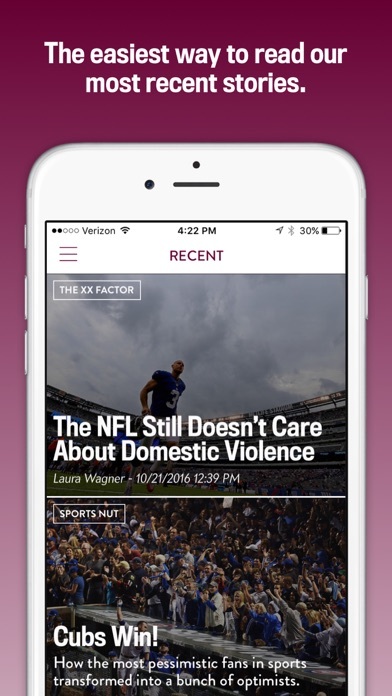 Good content but in terms of the app, so many bugs - where is the quality control on this? Loads of podcasts still have ads even though you pay to avoid them. Loads posted ages after being posted on iPhone podcast app, some missing bonus features, podcast click ticker never works... sort it out! They charged my card, I have a recent iPhone, and I can write code, but I still can't get Slate Plus to work. How about getting your sh#t together, Slate? I have always enjoyed Slate’s reporting and content. Until recently, the app had a few bugs or glitches, but I could usually restart the app and continue to read articles. Today, I open my app and there are now ads with sound that play even when my phone is on silent mode. This will prevent me from reading while at work or other situations where quiet is necessary. A disappointing development. Lack of ability to comment on articles brings the score way down! Search NEVER comes up with Slow Burn when I search for Slow Burn. It pulls up all of these totally irrelevant articles. why can’t there just be a list in alphabetical order of all the podcasts?? And why can’t I figure out, as a Slate+ subscriber, how to listen to commercial free podcasts? I will probably figure all of this out eventually but it makes me mad that I HAVE to figure it out instead of it just being a straight-forward app to navigate. Using this app to listen to Slateplus podcasts is not a very good user experience. There is no indication that a podcast is downloading. And I could not figure out how to use this premium service on the Overcast app. Will not let me log in, which means I cannot take advantage of my slate plus membership. Very frustrating. I am a slate plus member yet I don’t get all the podcast content you offer. I especially like Dear Prudence but can NEVER get the podcasts. There are also numerous SLATE podcast icons that show up in my feed but never any episodes. This app is not worth the aggravation. I’m trying to find Slow Burn Slate Plus episodes and it’s impossible. I read a lot of news on the Apple News app, where for the first time I’ve viewed Slate’s articles and interpretations. I’ve found them interesting, insightful, and succinct, thanks to excellent reporters and columnists. In fact, the quality of their work has led me to offer a little financial support by becoming a member. Love the site for the quality journalism and became a Plus member when the programme first started. BUT the app is really poor. Can’t ever load all the articles in the default “Recent”view—it usually loads the last dozen or so and then skips back seemingly randomly to a couple of weeks ago leaving out all the articles in between. Have written several times to tech support and app support through several channels and have never received a response or even an acknowledgement. I guess they just don’t care. User beware! I enjoy the easy to use slate app! I love Slate’s content, and am on the app several times a day. But, just like every other review, the app is pretty bad. The pop up ads that take you to safari make Slate feel like a clickbait site, being unable to see past a day’s content and the weird way it’s organized... come on, Slate. Hire some people who know what they are doing. I’m all for ads supporting my free reading, but get rid of the pop up ads, it’s unprofessional. Too many times there is no link to videos, podcasts, etc on the app. I have to go to the web version and search for the article to get the links. Ads pop up constantly, and not even in the app. They open in a separate Safari window, taking you out of the app entirely, and when I attempt to return, guess what? More ads! Trying to read just the headlines of recent articles today I had four ads remove me from the app to view them in my browser plus a funny or die video that popped up three times in a row requiring me to close three windows before I could attempt to read the article I was there for. I love Slate's content, but this app makes it next to impossible to access. Articles are good and I have enjoyed reading Slate in the morning with coffee. BUT, now this app starts playing video and sound ads without being clicked on. I live in a very rural area with limited internet data and this uses up my data, and forces me to have to keep turning the ads off. Not good, too invasive and cheeky. So - goodbye Slate, hello flip book and NPR. DELETED APP. I used to love the Slate app, enjoying the many varied articles. However, recently the app has begun to pop up ads in my Safari browser, which completely ruins the user experience. And they won’t stop! Even when you close them out, even when you force-quit the app, the ads keep coming. I’m deleting this from my phone. I like to use the “recent stories” section to keep up with what they post. However it seems that they backfill the stories. Right now there is a story that has been at the top of the list all day but there are articles below it that I haven’t seen before. According to the date and time on the articles they are in the correct order. But for some reason they don’t post to the app correctly. Hours between the times. Makes it very hard to tell when there is something new to read. I’m sure I’ve missed things thinking I had gotten to the parts I’d already read through. I paid 1 year sub right off w/o every using or reviewing app. I paid up and signed up primarily because Slate has outstanding writers on legal decisions. I always look to Slate when i want to wade through the status of some pending legal event. However, the balance of everything else is confusing. What is this Double X, XXfactor, moneybox, atlas obscura etc. I can’t figure how to join the commentary feature. I hate trying to figure things with systems. I’m not going to do. The app just shows a blank tiles where stories are supposed to be. I like the content, some days I even love the content. But I hate the app with a burning passion. It never works correctly. I currently have “The Slatest” stories that were published back as far as October showing. And don’t get me started on the ads that pop open out of nowhere and lock my iPhone and iPad in a rabbit hole of hellish redirects to places I’d never browse of my own choice. I’ve waited through multiple updates for improvements, but it only appears to be getting worse, so I Slate will be losing me as an app user. This isn’t worth the trouble!! !